The (Product) RED Windows Vista Ultimate OS, which debuted with Dell computers, will soon be available widely from Dec 15, 2008. (Product) RED is a brand that helps to raise money for the global fund to fight AIDS. Whenever a customer buys a (Product) RED product from its partners, some part of the sales are contributed towards the funds. People buying the Windows Vista Ultimate (Product) RED pack can find some new wallpapers, sidebar gadgets, a screensaver and DreamScene. The (Product) RED OS is currently being pre-ordered at Amazon for $220 (approx Rs. 11,000). 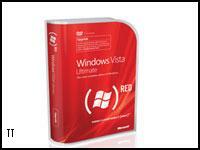 Students can also buy the Vista Ultimate (Product) RED Edition for $65 (approx Rs. 3,330).